An erect perennial herb, with short stout rootstocks and iris-like leaves. Flowers in terminal bracted clusters, rather large, orange and purple-mottled. Perianth of 6 oblong spreading nearly equal withering-persistent segments, distinct very nearly to the summit of the ovary. Stamens inserted on the bases of the segments; filaments distinct; anthers linearoblong. Style very slender, enlarged above, the 3 slender undivided branches alternate with the anthers. Capsule fig-shaped, obovoid, thin-walled, loculicidally 3-valved, the valves recurving, finally falling away, exposing the mass of black fleshy seeds, borne on a central axis. 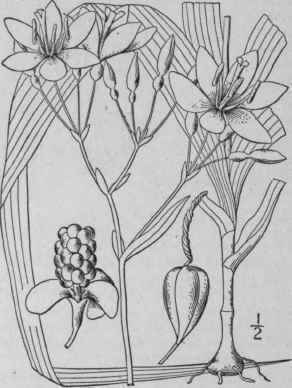 A monotypic genus of eastern Asia, based on Ixia chinensis L.
Ixia chinensis L. Sp. PI. 36. 1753. Belamcanda chinensis DC. in Red. Lil. 3: pl. 121 1807. Pardanthits chinensis Ker, in Konig & Sims, Ann. Bot. 1: 246. 1805. G. chinensis Kuntze, Rev. Gen. PI. 701. 1891. Stem rather stout, 1 1/2°-4° tall, leafy. Leaves pale green, nearly erect, equitant, folded, 8'-10' long, 8"-12" wide, the two sides united above the middle; bracts lanceolate, much shorter than the leaves, the upper ones scarious; flowers several-or numerous, 1 1/2-2' broad; perianth-segments obtuse at the apex, narrowed at the base, persistent and coiled together on the ovary after flowering, mottled with crimson and purple on the upper side; capsule about 1' high and rather more than 1/2 in diameter, truncate or rounded at the summit; mass of globose seeds erect, resembling a blackberry, whence the common name. On hills and along roadsides, Connecticut to Georgia, Indiana and Kansas. Naturalized from Asia. Leopard-flower. Dwarf tiger-lily. June-July. Fruit ripe July-Sept.